Hope you all had a Safe and Great Diwali!!!! I made Besan Laddus and Almond-Cashew Burfis for Diwali. 1) Fry cashew nuts and raisins in some ghee and keep aside. 2) Heat some ghee in a thick bottom pan on a low flame. Add besan flour and stir continuously. Occasionally add ghee into it. Keep stirring till the flour becomes golden brown and ghee separates. Remove from fire ,set aside to cool down a little. 3) After cooling ,add powdered sugar, cardamom powder, and fried cashew nuts and raisins. Mix well. Using lightly greased hands, Shape into small rounds or ur desired shapes when still little bit warm. 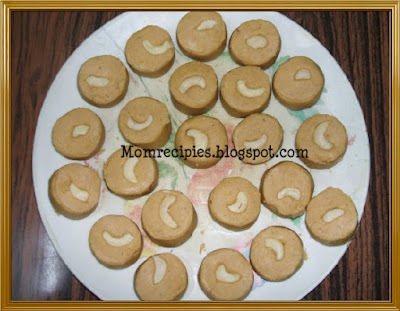 4) Store besan laddus in an airproof container. This is reaching the "FestiveFood: Diwali "event hosted by Priti. "JFI – Festivals Diwali Event" hosted by Srivalli. It is raining sweets everywhere and I am drooling at everyones pic, laddu looks tasty Sireesha. Yum Yum Yummy. Perfect in shape. Looks great .. Sounds like a tasty deepavali at your place. its looks perfect and mouthwatering sreesha. Hope u also had safe diwali and enjoyed. Looks too pretty and perfectly shaped. Wow Ladoo looks prefect Sireesha...delicious n love the colour..
Hi Sireesha, Hope you had a lovely Deepavali. .I have a surprise for you. Just visit me. Happy Diwali Sireesha :) Perfect color & shape..I am sure taste too! you are such a pro at making sweets......nice and perfectly shaped ladoos. Love Besan laddu... Made it for last Deepavali, and turned out great. They have come just perfect..looks yummy.. Happy Diwali Sireesha! Hope you had a lovely celebration with your family. e besan laddu ma hubby fav. one. diwaali bagaa enjoy chestunattu vunaaru traditional dishes tho. Wow...it love besan ke laddo but stop making them due to the ghee !! Yours looks so delicious...am virtually feasting on them..thanks for the yum entry. Lovely ladoos..thanks for sending in them! I think besan ladoo is simple... atleast simple in the instructions. I will try to prepare it and let you know if I face some problems. Here in our home in Cochin, my friend Jana's mother and father have come so now trying his Amma's food. All Amma's prepare delicious. When his parents are back to Chennai, I am going to try the besan laddu.